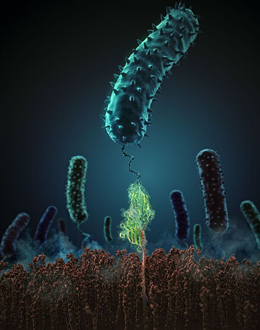 Bacterial pathogens have evolved highly effective strategies that enable them to adhere to target cells and niches in the tissues of their host organisms. They even make use of relatively unfamiliar physical principles, as a new study in the journal Science demonstrates. In collaboration with scientists at the University of Illinois in Urbana-Champaign, Lukas Milles and Professor Hermann Gaub of the Faculty of Physics at LMU have uncovered the mechanism that permits the bacterium Staphyloccus epidermidis to bind so tenaciously to host tissues. Indeed, the team has not only identified the physical basis for the interaction, but also characterized the adherence mechanism in unprecedented detail.